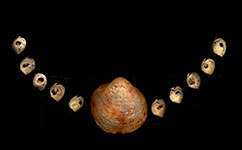 Beads from the site of Ksar Akil (Lebanon) found closely associated with the skeleton of an early modern human girl dating to between 39-41 thousand years ago. The traditional view is that the first humans with anatomy like ours evolved in Africa, then from about 50,000 years ago started to spread into the Near East before continuing into Asia and Europe. But the new study suggests they may have settled the Near East a lot later than previously thought, and that therefore the region may not be the single vital crossroads through which early humans passed on their way to colonising the whole Eurasian landmass. If so, the story of our spread out of Africa may need to be rewritten. Instead of colonising the Levant then moving into Europe, our distant ancestors may have first settled in the central Asian steppes before turning west again. She adds that the region has received comparatively little attention from archaeologists, so theories tend to rest on a very small base of evidence - the Near East is the least-dated area of the Palaeolithic world. On top of this, the region's hot dry conditions make scientific archaeology difficult - for example, the climate tends to destroy the collagen on which radiocarbon dating of bones depends. One of the most important sites in the region is Ksar Akil in modern-day Lebanon. Here, several fragments of ancient humans have been found over the years, crucially including a small part of a fossilised human known as Ethelruda, and another buried individual, whom archaeologists call Egbert. 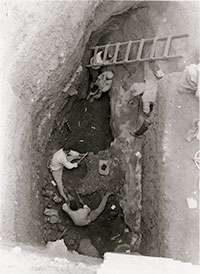 The excavations at Ksar Akil in 1938, with workers digging 17m below the surface. These have generally been seen as supporting the broader narrative of humans moving through the Near East into Asia and Europe. But until now, researchers hadn't used radiocarbon dating to check how long ago these people lived. The authors of a new study, published in PLoS ONE, set out to remedy that. They used modern carbon-dating techniques on material found in the same archaeological layers as Egbert and Ethelruda at Ksar Akil - mostly beads made from sea shells, which were used as jewellery and are often considered a sign of complex symbolic behaviour akin to modern humans. They couldn't radiocarbon-date the remains themselves - for one thing, both went missing in the twentieth century, although part of Ethelruda's jawbone recently turned up again. For another, the collagen in the bones has degraded too far to be used in dating. Analysis of the results shows the remains are considerably younger than archaeologists had assumed - between 40.8 and 39.2 thousand years ago for Egbert and between 42.4 and 41.7 thousand for Ethelruda. This means Egbert is about the same age as the oldest directly-dated human found in Europe, at the Pestera cu Oase in Romania, and younger than the oldest modern human teeth, found at Cavallo in Italy. 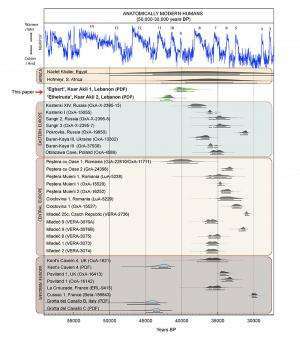 Comparison of the modelled ages obtained for Egbert and Ethelruda by the authors of the recent study with age estimates of anatomically-modern humans from other Palaeolithic sites between 50,000-30,000 years ago. Douka says more research is needed on other possible routes by which humans could have dispersed into Europe and Asia. She's currently working on several projects in central Asia and Siberia - areas she thinks could form part of one such route. She's working on a European Research Council-funded project (PalaeoChron) that uses another technique, known as optically-stimulated luminescence dating, which can go much further back into history - around half a million years.